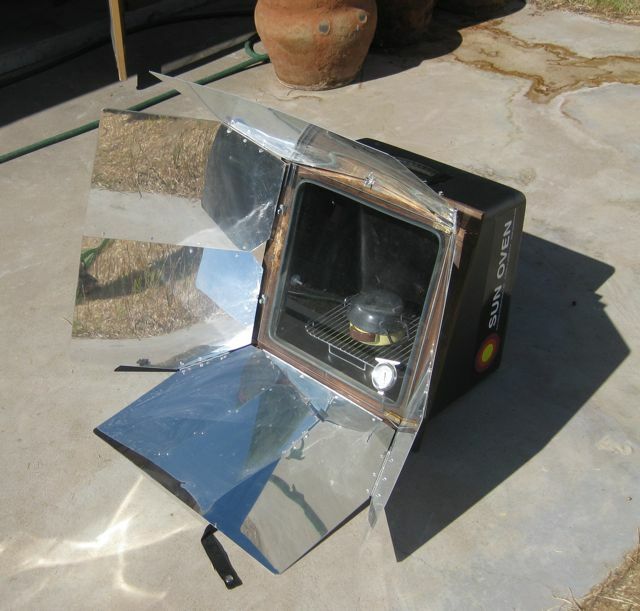 Now that the days are longer it's once again possible to fire up the Sun Oven a little earlier so last night I scoured the internet for a suitable recipe. I was thinking of making a strata but that would have required a trip to the grocery store, and a lot of prep work the night before. It was almost bedtime when I came up with the brilliant idea to make oatmeal, which is what I have for breakfast almost every day. To catch the first morning rays I set the Sun Oven up upside down, removed the leveling tray, and put a rack on the bottom of the cooking chamber. It was the steel cut kind so its normal cooking time is thirty minutes. I combined the oats in a small pot with hot tap water and half a banana, covered it and put it in the Sun Oven at 7:45. At 8:30 I was pleasantly surprised to discover that it was perfectly cooked and hadn't stuck to the bottom of the pan at all. Unfortunately I wasn't quite ready. I'd forgotten to put the coffee on so I left it in the Sun Oven to keep it warm and when my coffee was ready enjoyed a leisurely solar breakfast. I can't believe I hadn't thought of this before. It really doesn't take that much longer than making it stovetop and it tastes much better. I haven't tried oats in the oven yet. Good idea! Great idea. And, there's plenty of room for the coffee, too!